In over 30 years collecting this is the best GILT DIAL I’ve EVER owned. 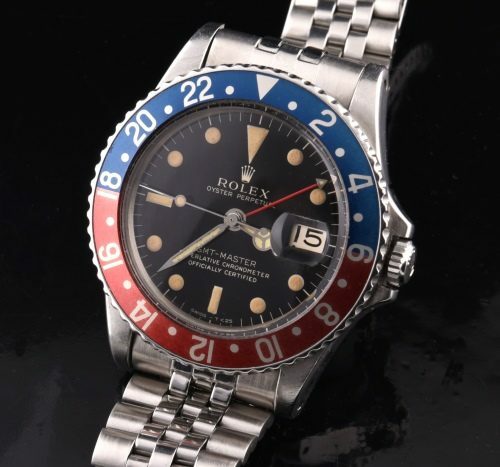 This is a ROLEX reference 1675 GMT Master. This dial is like a deep dark black hole with a mirror finish and fluffy vanilla luminous. The case, serial number and bracelet are ALL Dated 1966. The owner put the bracelet away and wore leather mostly, so the 1966 Jubilee bracelet is tight. We bought this watch from the original owner who babied it. The ORIGINAL fat font bezel is incredible-never changed. He says the hands were NEVER changed even though they are very subtly different in shade. The case looks fantastic and is without any major dings or scratches. This is truly the finest gilt dial I’ve EVER seen. I will regret selling this ROLEX GMT MASTER.